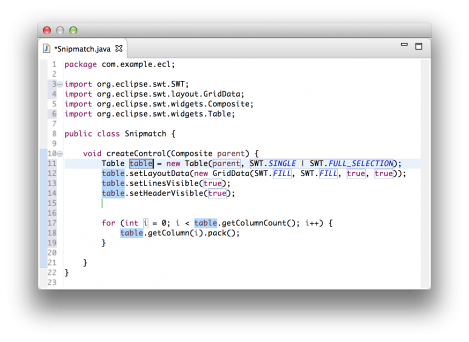 Snipmatch belongs to the Eclipse Code Recommenders tool family for Java Developers and is build around the concept of leveraging the community to continuously grow its snippet repository. So, if you do miss a snippet, you can simply create one with the powerful snippet editor and contribute it back to Eclipse - and so give back to the community by sharing your creations for everyone to use! At the time writing, Snipmatch's snippet repository hosted at eclipse.org offers more than one hundred code snippets showing how to use classes of the Java Runtime like Locks, Threads etc. but also offers a fair amount of snippets for the SWT and JFace framework. It's open to snippets for any framework. You may also use Snipmatch in-house for your own code snippets. See the contributors guide below for details. Have a feature request? Found a bug? Report it to our Bugzilla. add it to your marketplace favorites (by pressing the star symbol on top of this page). By adding the following code below to your website you will be able to add an install button for Snipmatch.